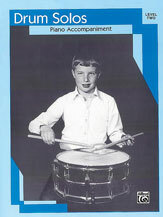 A collection of standard snare drum solos for contest, recital or jury. Contains: Battle Hymn of the Republic * Circling * Cut and Shoot * Echo Valley * Kirk's March * March for a Different Drummer * Our Director * Picking Up Six * Track South * Tie Two * Up Beat Pete's Suite * Vacation Antics * Whodonit. This piano accompaniment is intended for use with Drum Solos Level 2.